As always nothing good to do so thought of looking around what’s new from Microsoft for a normal PC user like me and I remembered I had downloaded MS Virtual PC but never actually tired it as my old horse cannot handle a virtual environment efficiently but what the hell if it can run Vista it bloody hell can run a virtual machine. I know there are a lot of other options available for creating a virtual machine but why look else where when Microsoft provides something as powerful. Note: I have not tried any of the other available options, I used this and I liked this. First up we need to download Virtual PC, follow this link to the download page. 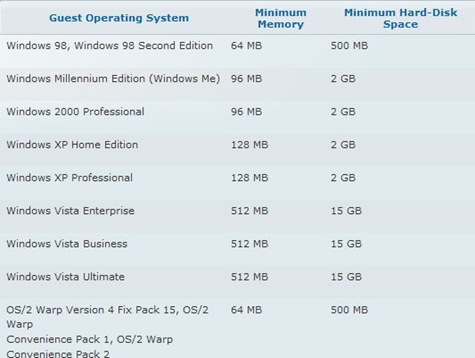 Here is a table by MS about the system requirements of some OSs, to use Virtual PC you should make sure that your machine can provide a little more than the minimum requirements of an OS. Saves the hassle of setting up a dual boot. 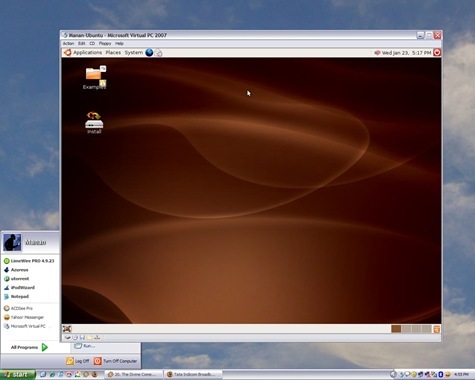 The ability to use 2 desktop environments at the same time. Allows you to see how the other OS behaves and works. Install any number of OSs. 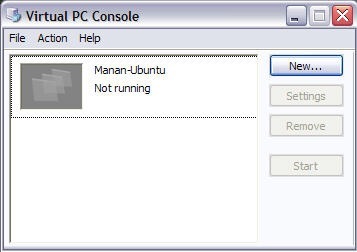 Once you have installed it, the first time you run it you are welcomed by a Setup Wizard. The wizard is very simple and you just need to read and choose the option you need and your ready. Let’s run through the setup wizard. 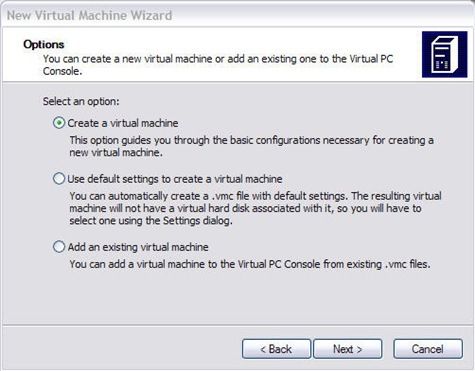 A New VM with all default settings – pretty cool I think no need for 1 to go through a wizard. Add an existing VMC (Will talk about this towards the end). We will choose the first option as we don’t like default settings and there’s no fun in computing unless you choose options yourself. 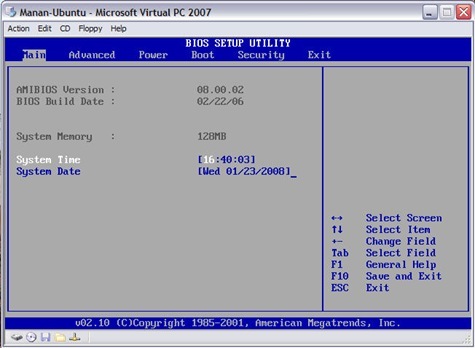 This is the screen where you choose which OS would you like to install; the drop-down shows all Microsoft OSs and the default (minimum) hardware requirements for the corresponding OS on the right. As we are going to run Linux we will choose Other. Also, don’t worry about the default hardware selection, this wizard will allow you to change that in the coming steps. Use recommended RAM (The 1 that was shown under Default Hardware Selection on the previous screen). Adjust the amount of RAM manually. We are techies and thereby don’t go for recommended settings! So, we will choose Adjusting the RAM; also it always better to allot RAM more than the minimum or recommended amount for obvious reason. A simple slider for adjusting the RAM and a box for manually entering vague amounts of RAM are provided choose the 1 you feel like. 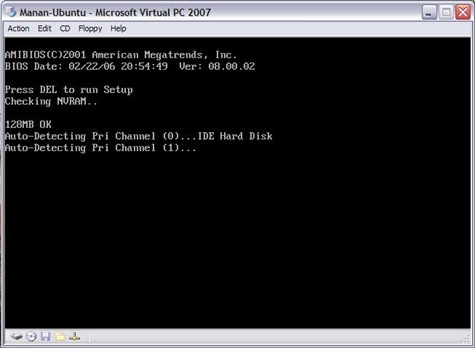 Virtual OS – Virtual Hard-Disk. 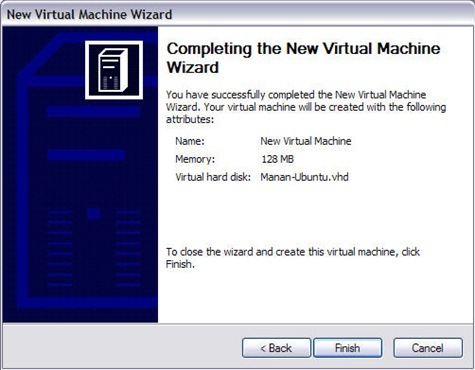 Welcome to the wizard to setup your Virtual HDD for the guest OS to store its files. Again a very simple wizard which allows you to either use an existing virtual HDD or setup a new 1, depending on your choice. As this is our first time – we do not have a virtual HDD and there by we select A new virtual hard disk. 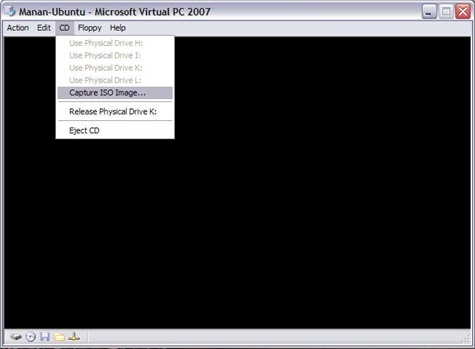 This screen allows you to setup your Virtual HDD – where you want to save this HDD and allows you to define the size of the virtual HDD. You can browse to any location where you have sufficient space to install and use the guest OS. NOTE: This is a Organic or a Dynamically Expanding HDD and can be converted into a Fixed size HDD or can also be compressed at a later stage. This is the last screen of the Setup Wizard and gives you a summary of the options you have chosen and the settings you have saved. 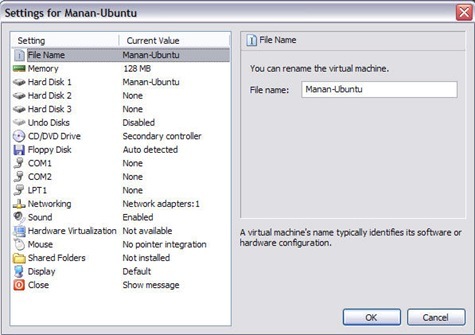 Here you can see the newly created machine, as you see the name shown is “Manan-Ubuntu” you can change this name after the wizard by selecting the virtual machine and hitting Settings. 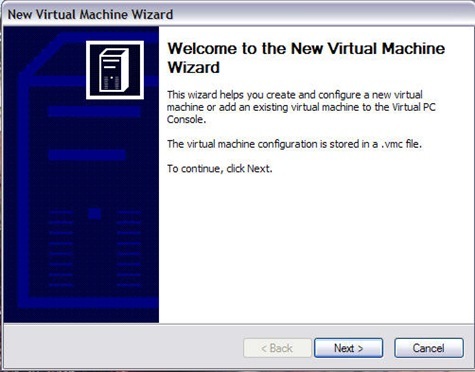 Now let us see after setting up the machine via the wizard what all changes can be made to the Virtual Machine. You will be surprised to see that you can change almost everything and more!!! As I said you can change the name of the machine and that’s not only it there is a huge list in the left column that allows you change and set almost everything about you guest OS resources. 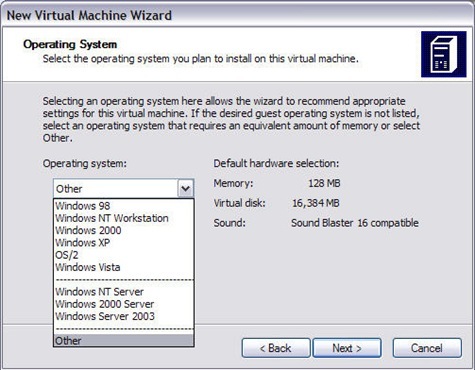 As you can see you have the option of assigning more than 1 virtual hard disk to the guest OS. You can set the guest OS to use your physical CD-ROM drive; yes even floppy drive support is there! The COM ports; Network adapters; Sound; Display; Mouse …. almost every hardware that you use on your machine can be setup on how should it behave or how should your guest OS interact with that device. I will not be showing you all the Setting options but some of them I have discussed below. You allotted too much RAM or too little RAM for the guest OS during the wizard – tension not! 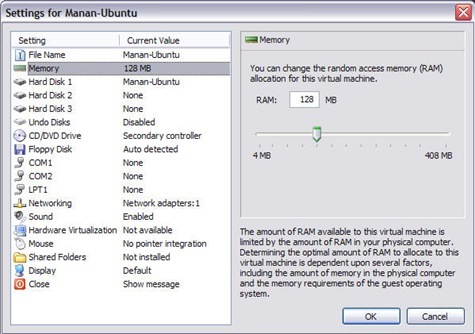 You can re-define the amount of RAM your guest OS should use from the settings menu and here you have the slider and a box for helping you with that. Now I am showing you this option because I really liked what it allows you to do. 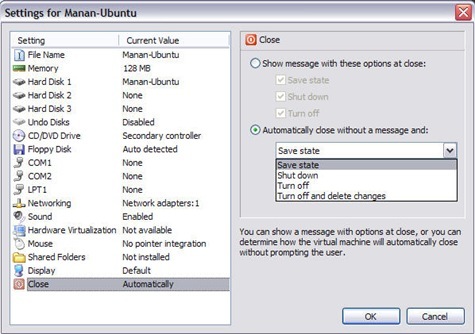 Whenever you choose to shut down your virtual machine you will be greeted with a shut down prompt similar to the 1 we get in windows but this goes a step further and allows you to define an action that should take place every time you choose shut down without getting a prompt and you even have the option of seeing the prompt every time or the virtual machine automatically performing the defined action. The below screenshot will explain things more easily. Now this was about the Settings under VPC Machine you made. 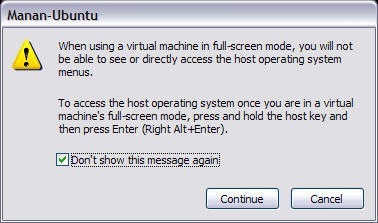 Let us fire up the virtual machine and see what happens!!! Capture ISO image – With this you can browse to an ISO image of an OS and it will boot or access that ISO disc. 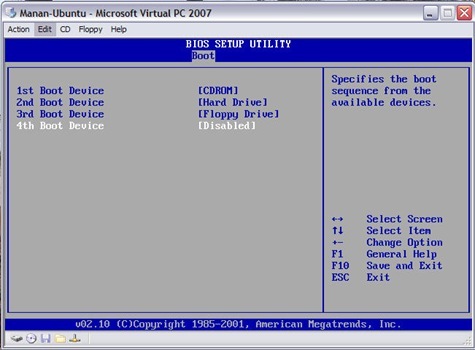 Release Physical Drive – I have chosen for VPC to access my physical CD-ROM drive as I will be booting Linux from there. Eject CD – For ejecting your physical CD-ROM drive. It has an in-built ISO reader which allows you to directly load an ISO image; VPC can boot with it or even access it later. 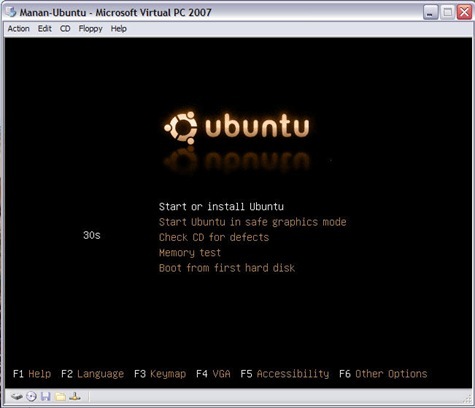 Ok, now the BIOS is set to boot from the CD we have captured the CD now lets boot into the OS with the CD, I have put the Ubuntu bootable disc in the tray and have restarted my machine. The dot blinks on the resource being used at the time; so if your VPC is using the network there will be a blinking dot on the Network icon so on and so forth. 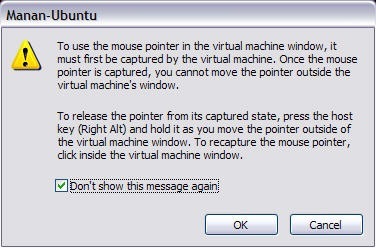 Well that was this and now one of the better parts of using a Virtual Environment is that you can carry your Virtual Machine and access it on any machine having Microsoft Virtual PC. 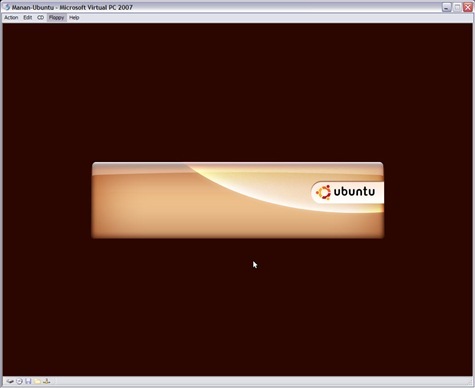 Lets say once you have installed Ubuntu or Windows XP on a virtual hard disk all you have to do is carry the virtual HDD (*.vhd) and virtual machine settings file (*.vmc) we created earlier in a pen drive. The location of both these files are defined by you in the initial steps of the Setup Wizard. Make sure MS VPC is installed on the other machine and all you have to do is double click on the VPC machine file with the extension *.vmc and it will automatically add itself to the MS VPC console and you can start using the Guest OS. 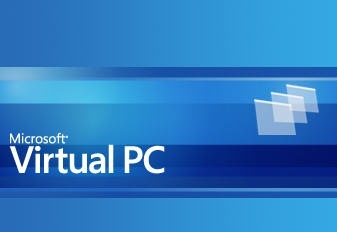 This is it, here I end my walk through of Microsoft’s Virtual Environment Client – Microsoft Virtual PC. Please remember that Virtual Environments require a powerful machine and thereby if a particular OS runs slower or not smoothly does not mean that it will give the same performance in case of a native install. A personal tip while using VPC is to give it with Highest Resource Priority from the Windows Task Manager. Peace, have fun … these are just the first steps to achieve the Matrix.